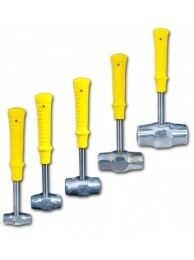 Most versatile of the line, these hammers offer the best features for most applications. The heads are cast of LSP’s “Soft Alloy”, a heavy, dense material which is quite soft and ductile, yet exceptionally wear resistant. The handles, consisting of a sturdy steel shank with a contoured safety-grip molded permanently onto it, are extremely durable. The grip, of a cushion synthetic rubber, has a comfortable, no-slip feel when grasped. 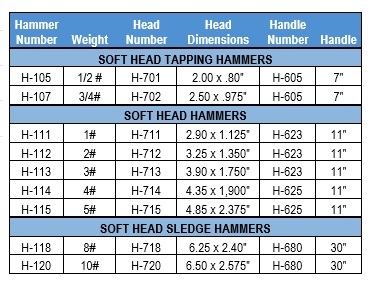 H-107 Soft Head Tapping Hammer Most versatile of the line, these hammers offer the best feat..
H-111 Soft Head Hammer Most versatile of the line, these hammers offer the best features for..
H-112 Soft Head Hammer Most versatile of the line, these hammers offer the best features for..
H-113 Soft Head Hammer Most versatile of the line, these hammers offer the best features for..
H-114 Soft Head Hammer Most versatile of the line, these hammers offer the best features for..
H-115 Soft Head Hammer Most versatile of the line, these hammers offer the best features for..
H-120 Soft Head Sledge Hammer Most versatile of the line, these hammers offer the best featu..